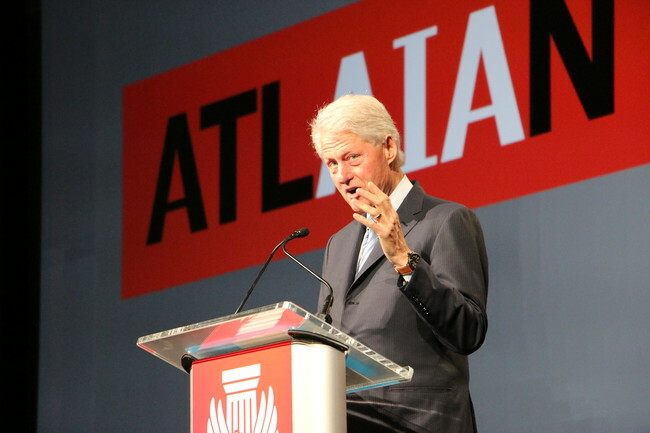 Former President Bill Clinton delivered a keynote address at the American Institute of Architects’ annual national convention. The 42nd president of the United States—who after introductions bounced spryly onto the stage—addressed a crowd of approximately 7,000 architecture professionals in the Georgia World Expo Center in downtown Atlanta, touching on a number of daunting global issues including terrorism, inequality, and global warming. But, he said, with the challenges come opportunities. “There is no question in ways large and small, those of you who are designing the built environment are going to have a big impact,” Clinton said. Clinton talked about development work he has conducted with his namesake foundation, including a new cholera treatment center in Haiti designed by Michael Murphy’s MASS Design Group. The former president also challenged architects to seek simple solutions to reduce carbon emissions and take advantage of “low-hanging fruit,” citing former New York City Mayor Michael Bloomberg’s NYC Cool Roofs initiative to paint city roofs white to increase cooling efficiency.